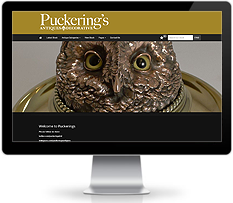 Quite possibly the perfect website for antiques dealers. 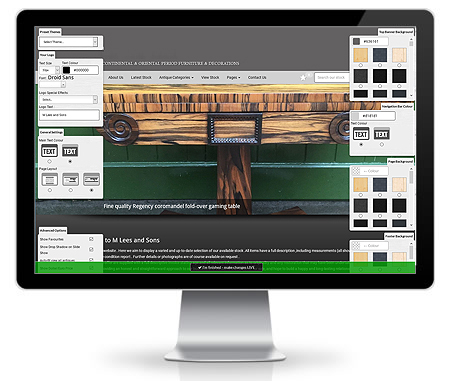 The ultimate customisable site, that will adapt to any device that is viewing it, mobile, tablet or desktop. You do not need any computer experience to use your control panel. It has been designed for the very novices among us. 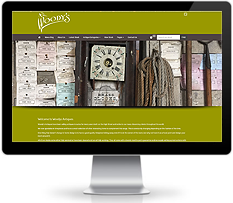 All of our websites are ready-to-go - no website experience or designer required. You can experiment with layout and colour schemes at www.websitesforantiquedealers.com on the demo page click to edit website and make changes live. You can make changes as often as you like, even when your website is live. Simply have a go and you'll find the colour scheme you like. 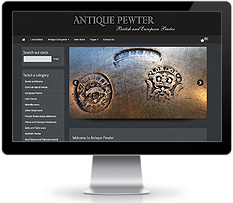 The Sellingantiques £399 websites have been designed by online antique specialists for antiques dealers. The navigation bar contains exactly what you need...your customers will easily find their way around your site and use filters to find exactly what they are looking for. 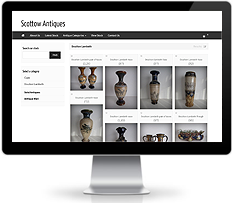 You choose which antiques categories to display and keep everyone updated with latest news. You can add links to your social network profiles and display the associations that you are a member of. The emphasis from customers and Google is that your website needs to be mobile-friendly. 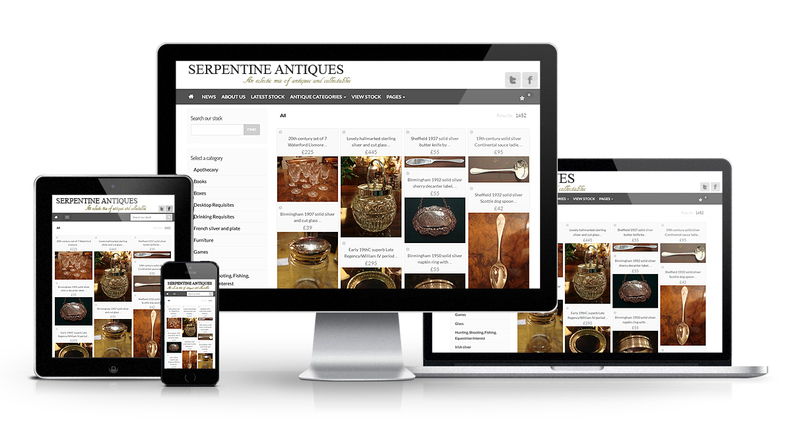 Your Sellingantiques £399 website will respond to any device be it desktop, tablet or smartphone. The internet today is demanding and standards are high. The top of the list is mobile-friendly. 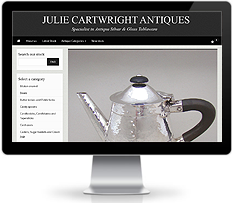 Sellingantiques.co.uk noticed a huge jump in return visitors since it went responsive in August 2016. 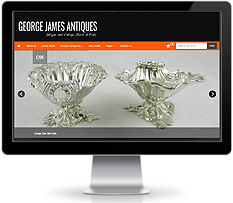 Sellingantiques has much experience with running a large antiques website. 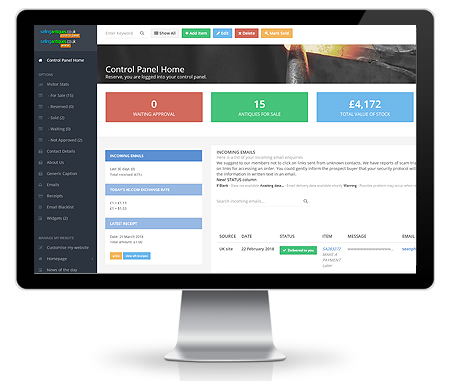 Our almost-award-winning control panel is used by 500 antiques dealers (and most are not very computer savvy) to keep their stock updated. Designed to be 'dealer-proof' you'll find it a whizz to update your stock yourself. Upload up to 15 photos with ease....change home page text, add homepage photos, marked items as sold. Anything you'll need to do...is now at your finger tips. 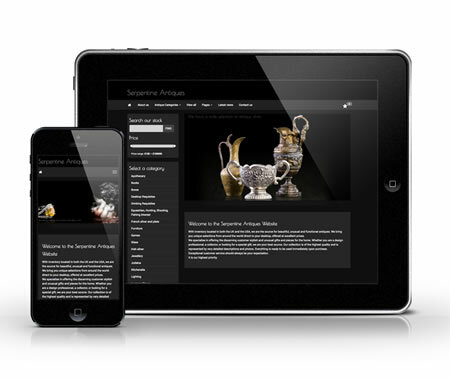 Sellingantiques.co.uk is the leading provider of website design to the antiques trade. In fact we don't design websites for any other type of business - which means we have the expertise and the experience to build a website that will match your needs perfectly. Our email system will give you the city and country of the enquirer resulting in better targeted sales. HTTPS is a Google algorithm ranking signal and sites may be ranked higher. Your website will be automatically optimised for search engines. That means that each time you add a new item to your website, the description will be "indexed" by search engines such as Yahoo and Google. So customers searching for items you're selling will find you! Using the latest design techniques we'll give your website a contemporary look, with sharp images and easy-to-read text. The clear layout will allow visitors to access your inventory and quickly find exactly what they're looking for. Your inventory of antiques will be displayed clearly and simply. Thumbnail images of your stock are shown alongside a brief description and price of each item. If a customer wants to find out more, they just click on the link to get more details. 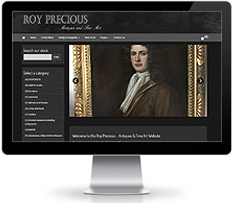 Sellingantiques.co.uk is fast becoming the leading online authority for UK antique dealers. We provide websites for some of the country's leading dealers and trade associations, so having our link on your website will enhance your online reputation. Setting up a new website and registering a new domain name (website address) can be a tricky business - so we take care of everything for you. Simply tell us your preferred website address and we will look after all the technicalities. You choose the colour scheme of your website. You can specify the colour of all areas of your site, giving you a choice of 1000's of different design combinations and ensuring your website is totally unique. This is a key page on any effective website. You can include just your email address, or list your telephone number and trading address too. You also have the option of including a Google map (no charge) enabling customers to locate your trading premises. 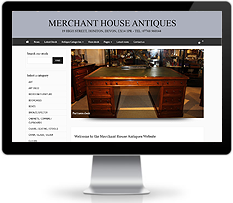 Using the latest "ThickBox" technology, when a visitor clicks on an item to view more details, the background of the page is 'dimmed' to give total prominence to the antique they wish to see. When finished viewing they simply click the â€œcloseâ€� button. The title of your antique is shown in a bold large font, followed by a description of the item along with the price and reference number. If you have a Paypal account the visitor has the option to buy the item instantly. You have the option to display up to 5 photographs of each item. Whenever a visitor views the detailed information about an item, they can also see your photos at full size, enabling them to see the item in close detail and from a range of angles. 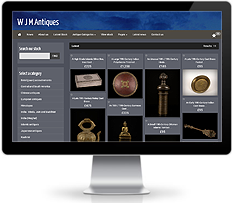 Whichever country you are from, you can purchase this website for antiques dealers. 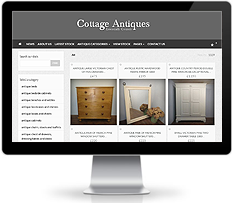 Every page of your website will link visitors to categories of antiques that you have created (using your control panel). 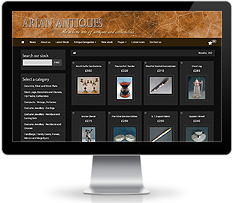 This is a highly effective way for visitors to browse your inventory by antique category. This is a back-catalogue of your sold stock. 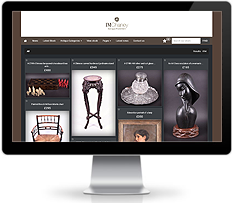 It allows your online customers to see what type of antiques you have stocked in the past. Items on the "sold items" page do not include a price, and all have a "sold" marker attached. 17. Address or no address? You have the option of including your contact details at the bottom of every page of your website. As some dealers don't want their address displayed (perhaps if they deal from home) then you have the choice of including either your full address or simply a region e.g. London UK. Greet visitors to your website with a welcome message that you can update any time you wish. Your welcome message can also be used to highlight upcoming events or latest news. Maintaining a consistent brand image across different pages is a crucial element of an effective website. It not only presents a professional image, it also helps customers become familiar with your website's layout so they feel comfortable viewing different pages. For customers who don't want to miss a thing! They can click on your "view all" link to display every single item in your inventory. Items will be ordered by price, from most expensive to least expensive. Looking after those foreign visitors could prove to be very lucrative. Providing your phone number in international format means you're more likely to encourage prospective overseas customers to pick up the phone and call whenever they see an item they're interested in. As your website is likely to attract visitors from around the world, showing prices in a range of currencies will help to encourage sales to overseas customers. By clicking on a particular flag, visitors can view all prices on your website in their chosen currency. A highly accurate â€œsearch boxâ€� will be shown on each of your webpages. This will enable visitors to quickly find precisely what they're looking for. 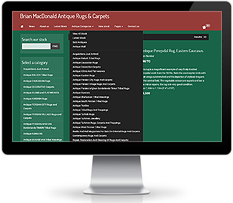 Based on usage statistics from Sellingantiques.co.uk your keyword search box will be one of the most popular elements of your website. When a customer performs a keyword search, these keywords are matched to the title and description of the items that you upload to your website. The results are displayed according to relevancy and sorted by price. 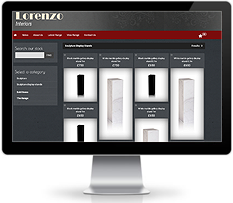 Your website will automatically filter your inventory to show the very latest items that you've uploaded. This feature should appeal to your regular customers who can quickly view your new stock. Visitor usability studies have consistently shown that placing a digital â€œclockâ€� showing the live time on your website can vastly increase the perceived freshness of your website. Visitors are more likely to will feel your website is relevant and up-to-date. The only eyes that will want to see this page are those belonging to search engine spiders (programs that crawl across the web â€œreadingâ€� website content). This page is designed to enable these spiders to find every nook and cranny of your site - so Google will know precisely what you're selling. This is your doorway to your control panel where you'll be able to update all aspects of your website quickly and easily. You won't need a web designer or even a web design book. In fact, it's so straightforward you won't even need any computer experience. This page enables you to link to other websites that you like or with whom you are building a linking campaign. This is ideal for Search Engine Optimisation, something that many website owners like to get involved with. Inform your customers about your methods of delivery. This is your opportunity to tell your customers how their goods will be shipped to them should they make a purchase on your site. This is an optional feature that allows you to write about any news items that may be of interest to your customers. This page will not appear on your website if you do not enter any news content. Testimonials from previous customers can be a very powerful way of establishing your credentials, particularly when it comes to convincing new visitors that you provide a good quality, professional service. This page is optional and will not appear if you do not enter any text. There are bound to be some questions that many of your customers will want to ask. How do I pay? Is my item insured? Can I visit your premises? What are your opening times? The F-A-Q page lets you provide answers to common questions, leaving you with more time to answer more specific queries. 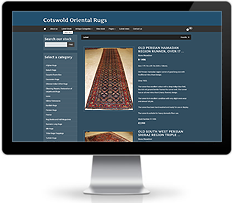 Your â€œabout usâ€� page is your chance to tell your customers all about your antiques business - and to let them know why they should buy from you. A link to â€œabout usâ€� will appear on every page of your website. Similar to the â€œlive timeâ€� feature, the "website last updated" figure shows when you last added any news content or changed the inventory on your website. Updating content at least once a month helps to ensure your site feels fresh and relevant to visitors. Yes, every self-respecting website should have one of these. This page simply contains universal privacy information. Search engines love to find privacy policies so it will help in search engine ranking too. If you are a member of BADA, LAPADA then we'll place your association logo on each of your pages. It's another â€œtick in the boxâ€� in building your online reputation. 38. Antiques RSS Feed - automatically created. This is a â€œnewsâ€� service that visitors to your website can sign up to. It's another feature designed to help your website in search engine indexing, plus it's also useful for visitors who want to be notified whenever you add new items to your site. This copyright notice will automatically be updated on 1 Jan of each year. There's no need to remember to update it - it's just another simple feature to make your online life more enjoyable and hassle-free. Once your visitors have begun to explore your website they have two options to navigate back to your homepage. There is a "home" link on the navigation bar, and clicking on your company name will also send visitors â€œhomeâ€�. 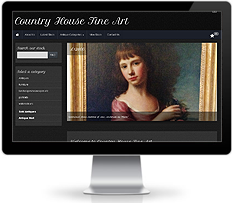 You have the opportunity to select a photo of an antique for your homepage, something that you think will present a good image to your prospective customers. You may wish to highlight a particular item of stock or perhaps showcase a favourite piece. Your company name will feature in the top centre of each page of your website. If you have your own logo, this can be displayed too. Reinforce your USP (unique selling point) by highlighting your speciality to your visitors e.g. 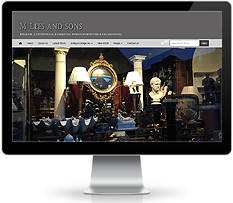 â€œEstablished in Devon since 1973â€�, â€œSpecialising in Antique Furnitureâ€�. Maybe you would like to use a different font for your company name? Simply let us know which font and we will make the adjustments when we build your site. All the pages of your website will be designed to clearly separate the different aspects of your website - company name, navigation, categories and searches, contact details. This makes it easier for customers to navigate around your site - so they can easily find what they're looking for. 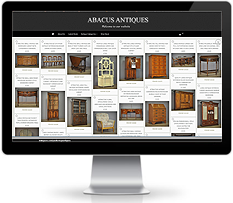 Using the antique wall system we have built for the sellingantiques website you can display all your stock beautifully on one page. This area of your website can be used to add news , or customer advice or tips , or a general blog. Each entry can have a slideshow of images and is easily managed within the control panel. 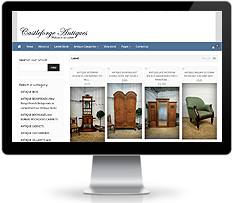 Your control panel homepage will display a summary of your website inventory - how many antiques you have for sale, how many sold, visitor statistics etc. It will also contain any messages that we might want to draw to your attention. When you want to add a new item to your website, you'll first be asked to upload a photo. 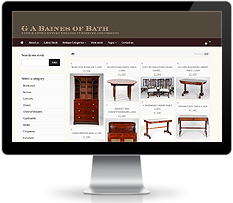 Then you simply enter the title, price, description and reference number of your item, and your antique will then be live on your website. If you want to make changes to an item you've already uploaded, simply select either "edit text" or "photos" and make your changes. It's very simple and easy to use, and there's certainly no technical knowledge required. 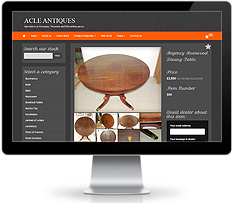 When you want to remove an item from your website all you have to do is click a single button to permanently remove the antique from your listings. 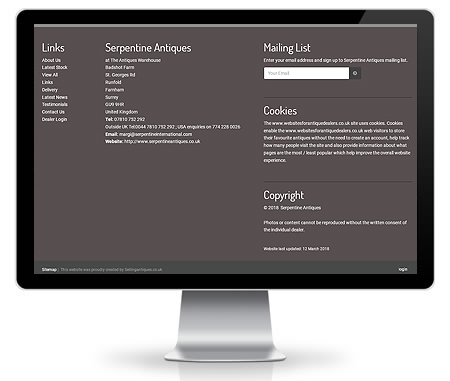 This enables you to keep a "back catalogue" of all your listings. 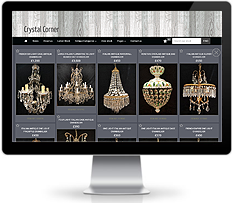 It also shows your visitors the types of antiques you have sold in the past. A click of a button will mark that item as sold. Updating the text on your website is very simple. Simply select the page you want to change and add the new text - and your new content will be live. 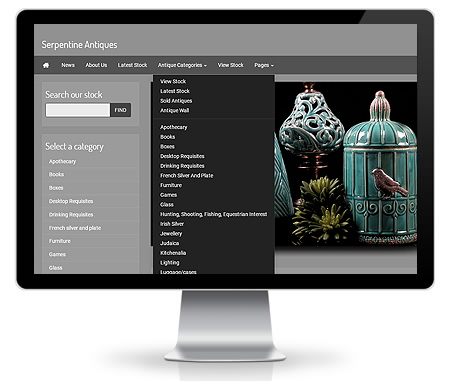 You can use your control panel to search for antiques within your online inventory. Simply enter the keywords and the in-built search facility will list all relevant items. This is the antique featured on your homepage. You can change this as often as you wish. This enables you to add a new category to your website. Your categories appear on the left-hand-side of each page of your website. This handy feature is very useful if you decide to change the name of a category, perhaps to give it a broader appeal. If the category does not have any antiques associated with it, you will have the chance to remove it completely. This will avoid wasting visitors' time, which is never a good way to convert browsers into customers. 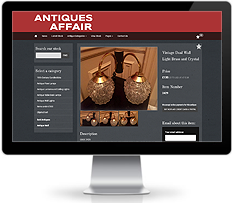 his gives you a brief overview of the number of times your antiques have been viewed on your website. It's basically a tally of viewings of each of your items and can be a very handy little feature. 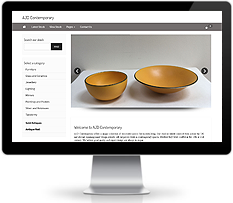 If you want to add links to other antiques businesses or other websites, you can simply add the details here. This section enables you to update the contact information shown on your website. You can also add a "caption" to each of your listings. Captions enable you to automatically show the same chunk of text underneath each of your antique descriptions. This feature ensures that only you or authorised staff members are able to make updates to your website. Daily backup of all your data ensures you will never lose any of the valuable information on your website.